Good, helpful service and a great range of cask and keg offerings - Hanlon's had a tap takeover while there was a good mix of representation for local breweries as well as more far flung craft operators. We went in the day when it was relatively unbusy - while the location at the end of the cathedral green is also very good. 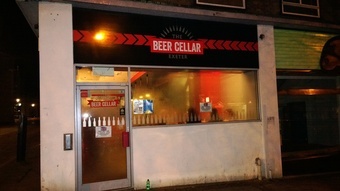 When the Beer Cellar first opened we used to visit it regularly but haven't been there for ages now. The last time we went it was bitterly cold inside - I started shivering after a while (drinking cold beer didn't help either - cold inside & out) & so we went along the road to George's to warm up. Prior to that they'd just made some new seats - very uncomfortable. We've intended to go in more recently but it's generally very busy and I don't drink beer standing up. Shame as they have some interesting beers & the staff & most of the customers are very friendly. An uncharacterful micropub but with some excellent beer choice. Although it was advertised as doing food they didn't so we bought a couple of pasties and ate them in the pub (with permission).